South Korea and China are holding a series of talks in Seoul to tackle the fine dust problem amid mounting public concerns over increasingly toxic levels of fine and ultrafine dust believed to originate mostly from China. Director-generals from Seoul’s Ministry of Environment and Beijing’s Ministry of Ecology and Environment held their third meeting on fine dust in Seoul on Tuesday, the same day as the first meeting of an operating committee within the South Korea-China Environmental Cooperation Center, which opened in Beijing in June. On Wednesday and Thursday, the Foreign Ministry is set to host the 23rd meeting of the South Korea-China joint committee on environmental cooperation. The meetings come amid intensifying disputes between the neighboring countries over the source of the hazardous fine dust particles across Northeast Asia. China has denied responsibility for the fine dust over the Korean Peninsula. A ranking official with the Chinese Ministry of Ecology and Environment said Monday that South Korea should focus on tackling the problem instead of blaming China, according to a news report. “Air quality in China has improved 40 percent, while that of South Korea remains the same or has worsened slightly (in the same period),” he was quoted as saying. The widespread perception in South Korea is that a large proportion of the dust originates from industrial areas in China, but there is no scientific research measuring how much China contributes to the air pollution here. A particle of fine dust is smaller than 10 micrometers in diameter, and a particle of ultrafine dust is smaller than 2.5 micrometers. The particles can travel through the respiratory system and into the bloodstream, causing damage to the immune system and to organs such as the heart and lungs. The hazardous levels of fine and ultrafine dust that blanketed a large swath of South Korea in recent days added to the growing pressure on the government to address its fundamental causes. During a Cabinet meeting on Tuesday, President Moon Jae-in called for strong efforts to reduce air pollution and step up cooperation with China. “I am also well aware of the fact that our people have great concerns about fine dust coming from China. We need to strengthen our cooperation to significantly reduce fine dust because China too is suffering from it,” he said. 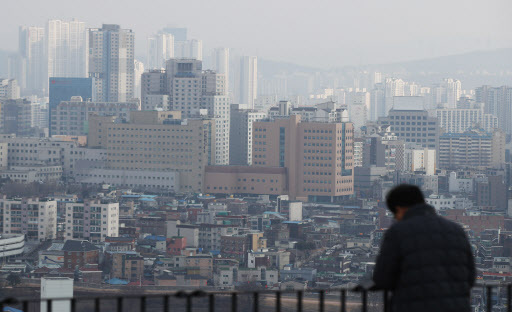 The level of dust in South Korea saw an increase this winter on warm days, which forced people to stay indoors and prompted the government to enforce emergency measures aimed at cutting domestic emissions.